DJI's first collaboration with renowned camera maker Hasselblad since they bought a minority stake in the Swedish firm has born fruit with the arrival of a new high-end drone. Marrying the professional six rotor Matrice 600 monster drone from DJI with Hasselblad's A5D aerial camera, you'll be able to capture detail-rich still images thanks to the 50Mp medium format sensor (twice the size of full-frame chips found in the best DSLRs like the Nikon D810), that's been borrowed from the recently announced X1D mirrorless camera. The A5D features an adapted 50mm f/3.5 lens that will be preset at infinity focus, so focusing shouldn't be an issue once you're up in the air, while the Matrice 600 is capable of taking a payload of up to 6kg - more than enough power to comfortably fly the A5D with a Ronin-MX gimbal head attached. 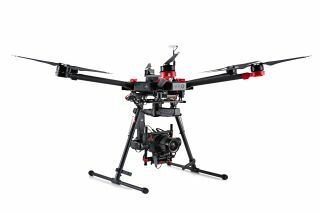 The Matrice 600 also features six intelligent batteries, an A3 flight controller, Lightbridge 2 Professional HD transmission system, a dust-proof propulsion system and powerful app control. Pricing and availability for the kit are still to be confirmed, but the Matrice 600 and Ronin-MX will set you back £5099 ($5999).